There are multiple strip methods you can use to make and connect plarn (plastic yarn) strips. The 3 methods I'm aware of are - 1) Double-Strand; 2) Continuous (Single-Strand) Strip and 3) Connecting Strip. Tip: Any of the strip methods can also be used for fabric; pillow cases, t-shirts, etc..
Lay the bag out flat, straightening out the straps. Fold bag in half (folding bottom up to be even with the top) matching up the handles then a couple more times for easier cutting. Cut straps off at the base of the straps and bottom seam. 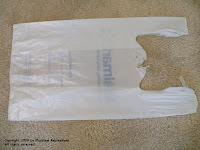 Cut off bottom seam of bag. Just a sliver is all that is needed. Drop the 1st strip from your hand. (In the picture above it will be the strip in the middle.) You now have something that resembles a ‘T’. Now take the bottom strip (In the picture above it will be the strip closest to the fingers) and lay it over the strip still sitting on your hand. Now grab the strip closest to the fingers (strip on bottom) with one hand and pull to form a small knot. (Reminder: Your primary objective is to avoid breaking the strip which is very easy to do if you pull too tight). Keep adding strips using this same method (eventually you’ll grasp the concept of connecting the strips and won’t have to use the ‘hand method’). · Avoid ripping the strip from pulling too tight. · Keep the 2-strand strip even. · Make the knot as small as you can. You’ll find that some strips will knot gracefully but believe me there’s always those few that will make you work for it. When this happens you just have to do a little pulling and tugging on the knot.